"Cadastre 2014" is the result of a working group of FIG-Commission 7 looking at trends and developments in the field of cadastre. The working group was active from 1994-1998 and presented the results at the FIG-Congress in Brighton in July, 1998. It projected the trends and developed visions of what cadastral systems might be in 20 years' time. Cadastre 2014 has received worldwide attention and has been translated into 28 languages. Steudler, D. (2004). Cadastre 2014 - A vision for a future cadastral system. Presentation at EuroGraphics Workshop on the 'Future of the Cadastre', 2/3 Sept. 2004, Paris. Kaufmann, J. (2002). Cadastre 2014 - A Vision on Future Cadastral Systems. Paper and Presentation at 1st Congress on Cadastre in the European Union, Granada, 15-17 May 2002. Kaufmann, J. and Steudler, D. (1998). 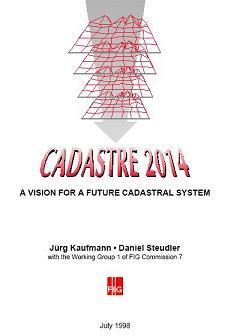 Cadastre 2014 - A Vision for a Future Cadastral System. Paper and Presentation at Technical Session 7, XXI FIG-Congress, Brighton, July 1998.